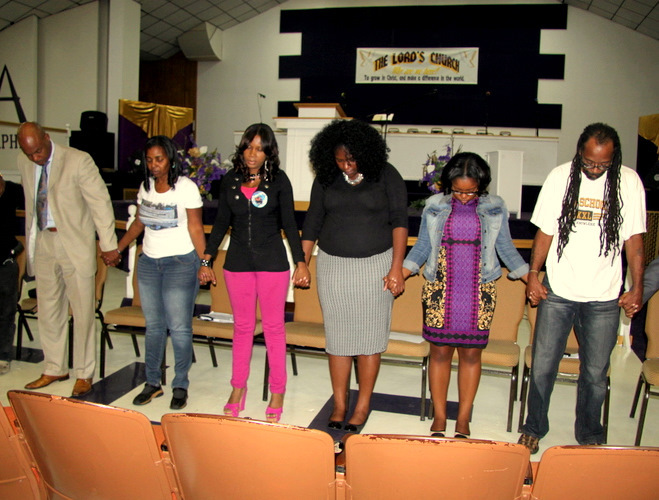 Above: Participants at a town hall meeting hold hands with Tyrone West’s family in prayer. Speaking with urgency in the wake of the recent police shooting of an unarmed man in Ferguson, Mo., preachers, activists, a city councilman and others addressed a town hall meeting held in Park Heights last night. The news hook for the event may have occurred hundreds of miles away but the underlying issues, and the horrific experience itself, hit home for many in the room, particularly the relatives of young men who died as a result of encounters with police here in Baltimore. “This is real pain. 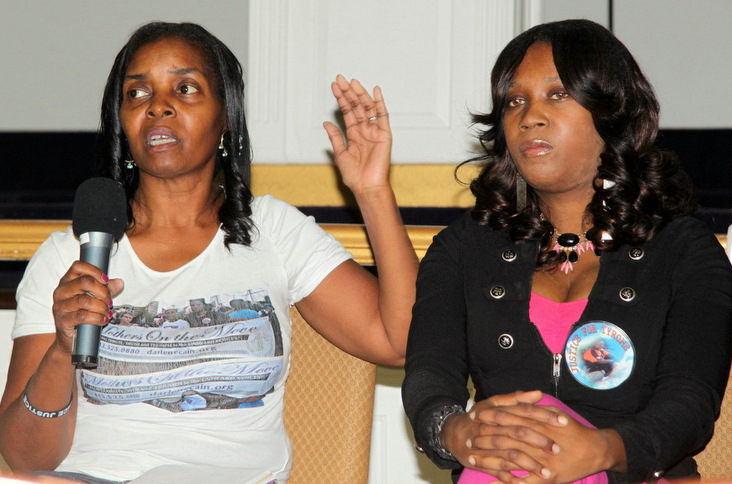 We don’t want another family to have to go through what we went through,” said Tawanda Jones, the sister of Tyrone West, who died in July 2013 after a traffic stop in Northwest Baltimore turned into a fight with multiple officers. Jones patted Darlene Cain gently on the back as the two of them sat on a panel at the forum. Cain took her turn, talking about dealing with the grief after her 29-year-old son was shot and killed by a city police officer in 2008. “We were mourning. We didn’t know what to do,” Cain said as about 150 people at The Lord’s Church listened. Cain’s response was to create a support and advocacy organization called Mothers on the Move. West’s family members filed a civil suit against the Baltimore Police Department and Jones, along with other relatives and supporters, has been picketing outside City Hall (on “West Wednesdays”) and pressing for changes that would safeguard citizens from police use of excessive force. None of the officers involved in the West case were criminally charged. A review panel found the officers did not follow proper procedures, but concluded they did not use excessive force. An autopsy found that West died of a heart condition exacerbated by the summer heat. 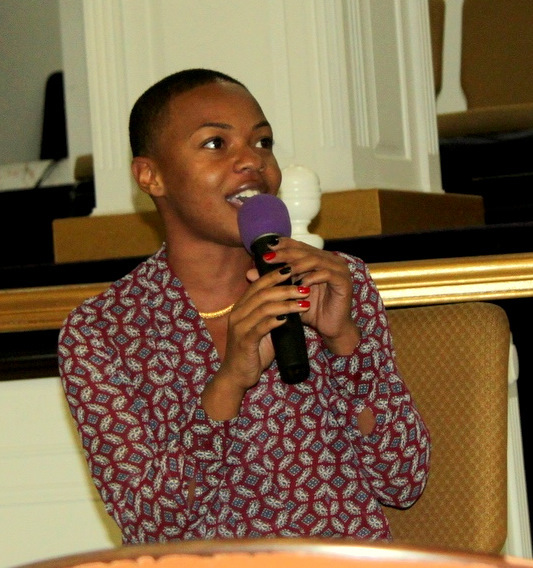 Coming up with an effective strategy to improve police-community relations – and prevent more in-custody death and injury – was a focus of the event, organized by BmoreNews producer Doni Glover. One starting point for the discussion was simply referencing the recent incidents, as Rev. Cortly “C.D.” Witherspoon did in his remarks to the crowd. Witherspoon, president of the city branch of the Southern Christian Leadership Conference, mentioned Anthony Anderson, who in 2012 died of blunt force trauma in a vacant lot after being injured by arresting officers, and George King, an unarmed teen who died earlier this year at a city hospital after being shocked by police with a Taser allegedly multiple times. Others brought up the dramatic video showing a city police officer, since suspended, viciously beating Kollin Truss at a bus stop on North Avenue. Still others noted that the magnitude of the problem has been plain to see for years as police brutality settlements pass through the city’s spending panel, the Board of Estimates. “Structural racism is real,” said Sarah Hemminger, founder of Incentive Mentoring Program. She cited statistics indicating that a young black male with no record has a significantly lower chance of being called back for a job interview than a young white male with a record. Others called for fixing what they said are the black community’s own failings putting them in harm’s way with police and each other. Dedmon started a children’s radio station she said will steer children toward positive cultural influences. Another speaker, Angela Koukoui, started a dance program in the city she believes offers another answer. “The arts saved my life,” said Koukoui who said she’d been depressed from a young age, growing up with a drug-dependent father and a teenage mother. How can the arts help? But mainly the speakers focused on the specific issue of police using excessive force and government officials failing to hold them accountable for it. Powers, executive director of the Children First Movement, had specific recommendations for more transparency in policing, including an update of the use of force policy, tangible sanctions for sustained lawsuits against police officers, and a website publicly documenting all use-of-force incidents. “All profanity by police officers against citizens should be prohibited and violations enforced with suspension without pay,” he said, eliciting cheers from the audience. Christopher Ervin called for police to have video cameras on them and on their cars’ dashboards to record interactions with the public. Russell A. Neverdon Sr, the write-in candidate for city state’s attorney, was one of several speakers who criticized the Maryland law enforcement officer’s Bill of Rights. “It’s got to go,” Neverdon said. Under the law, disciplinary actions against police go through a three-person trial board. The police commissioner cannot suspend the officer without pay until that three-person board has ruled (unless the officer is charged with a felony). In his remarks, 12th District Councilman Carl Stokes criticized Mayor Stephanie Rawlings-Blake and Police Commissioner Anthony W. Batts for characterizing citizens as too afraid to cooperate with police. “I’m tired of the mayor and the commissioner calling out people and saying they don’t stand up,” Stokes said. Also coming in for criticism was the meeting held last night by Rev. Jamal Harrison-Bryant at Empowerment Temple Church, convening lawyers to advise young people interacting with police officers on their rights and on the value of being respectful. Rev. Dr. Heber Brown III, of the Pleasant Hope Baptist Church sent the group out with the advice that each should approach the sometimes overwhelming-seeming problem in their own way. Read Rev. Brown’s “call to action” about police misconduct published in The Brew. The police department’s response to the handcuffed pastor case, cited in Heber’s article, is here.